I never really need a reason to celebrate books. I do it every day by talking about them non-stop, buying as many as I can in hopes that I am in some way saving the bookstore industry, and sniffing the pages of my old favorites just for the heck of it. Since this week is Banned Books Week, which urges Americans to celebrate the freedom to read while highlighting the pitfalls of censorship, I feel the need to do something more, like sing the Reading Rainbow theme at the top of my lungs while doing a little dance through the aisles of Barnes and Noble. Or maybe I’ll settle for gushing about one of my favorite books of all time, the often-banned The Sun Also Rises. The idea of books being banned from certain schools and libraries is baffling to me. Even though it’s gone on for centuries and continues to happen to this day, it’s one of those things that I just can’t wrap my head around—like calculus or the fact that Big Brother is still on the air when Friday Night Lights isn’t. Keeping classics out of students’ hands because of foul language and s-e-x is mind-boggling; it’s depriving them of some of the world’s finest literature for the sake of a few words that are probably much cleaner than what they’ve heard in school hallways. Over the years, many of Hemingway’s masterpieces have been banned from classrooms due to profanity, promiscuity and the overall decadence of his characters—which is kind of funny when you think about anything shown on TV these days—but fortunately for us, his popularity has never waned. Published in 1926, The Sun Also Rises follows the post-World War I adventures of a group of expats who like to go to nightclubs in Paris and watch the bull fights in Pamplona. On the surface, it’s about a few men who fight with each other over one foxy woman, Lady Brett Ashley, and none of them are good for her except (maybe) for our protagonist, Jake Barnes–but he’ll never really have her because he’s impotent from a war wound and she likes to get around. They get drunk, they talk, they break into fist fights, they talk some more. 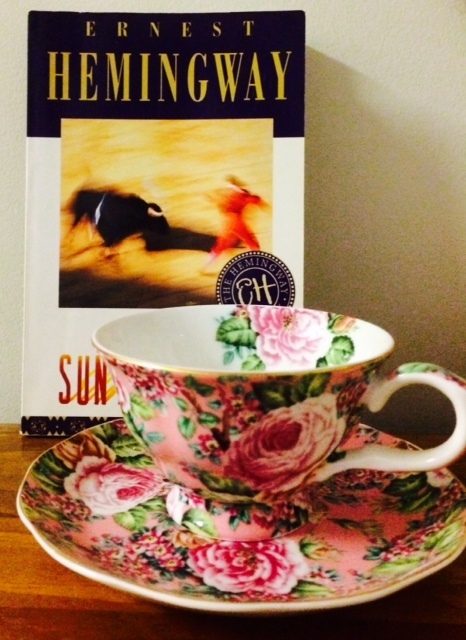 It’s Hemingway at his very best, and like any Hemingway novel, there is so much more going on under the surface. I have read this book so many times, and every time, I love it even more. I don’t think I will ever get over the brilliance of Hemingway’s writing. With so few words, we know who these characters are and what they’re all about. When Jake first reconnects with Brett, it takes two short sentences for the reader to know exactly how he feels about her. Two sentences. When I think about it, all I want to do is curl up with my ear-marked copy, devour it and not talk to anybody, unless they want to talk about how perfect the ending is. When Hemingway came along, no one had ever written like him. No one had ever seen anything like his prose and a lot of people didn’t know what to make of it. Pretty soon it became clear that he was a complete game-changer and everyone who was going to write a book after him would need to take a lesson. Then everyone in the world did try to write like him but no one pulled it off because Hemingway was the only person who could do Hemingway. And I’m okay with that. I’ll never be a member of the Lost Generation. I’ll never sit in a 1920’s Paris café and I’ll never have a bull’s ear handed to me by a nineteen year-old bullfighter named Pedro (which I’ll learn to live without). But when I read Hemingway, I know how it all felt. I can see it, smell it, hear it with every word of his gorgeous dialogue. Hemingway’s gift is letting us see the true power of words. The fact that this book was ever banned for loose morals and a little booze—including by my own city of Boston in 1930—is truly hard to believe. So yes, Banned Books Week. I will gladly celebrate the freedom to read. And I will read the hell out of my dear Papa Hemingway, because unless Doc Brown comes along with his DeLorean, it’s the only way I’m getting to post-war Paris tonight. Another example of why books are so important in our lives, the influence they have on us. Well done again, Stephanie! I’ve never read The Sun Also Rises, but it just occurred to me that Hemingway really can write an ending. I can’t really think of another author who so consistently sticks the landing. Oh! New Top 10 list idea: Best endings. YES he can write and ending and YES, I love the idea of top 10 endings! Challenge accepted! You should read The Sun Also Rises. It’s my very favorite Hemingway, along with A Moveable Feast! I am not super good at remembering books after I’ve read them, but I remember being enthralled with the way Hemingway is able to create an atmosphere of a nearly oppressive, feverish kind of heat that settles on Pamplona in the summer. Long after I’ve forgotten the specifics of characters and events, that endless, relentless heat of The Sun Also Rises stays with me in a way that feels more real than some killer summers I’ve personally experienced firsthand. It’s more real than real, more true than true. It’s great.